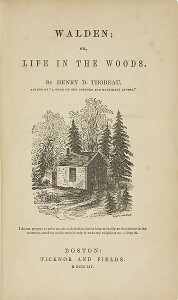 Henry Thoreau publishes Walden at the peak of the American Romanticism movement. Thoreau writes in great detail about his relationship with nature and isolation from civilization. Ten years later in 1864, George Perkins Marsh publishes Man and Nature. Marsh is one of the first Americans to document the effects of human action on the environment. His works played a significant role in the modern conservation movement. Books such as these played a crucial role in bringing environmental philosophy and thinking directly to people.